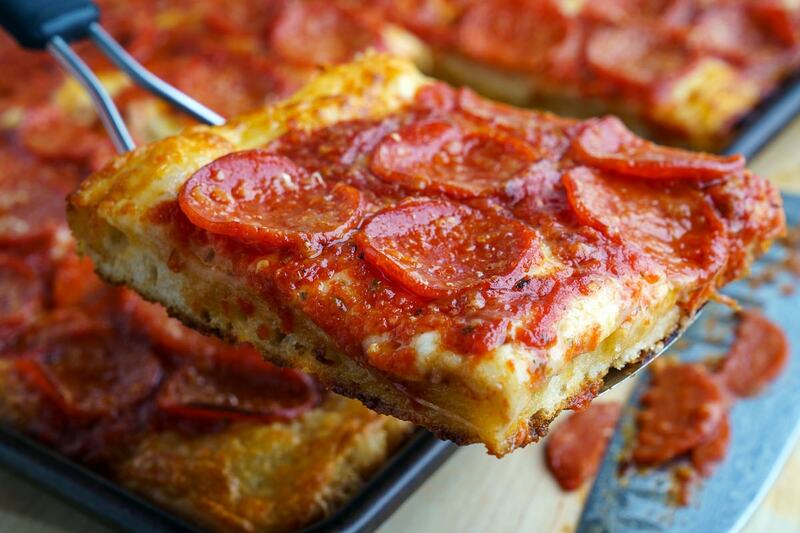 Sicilian style pizza with a thick focaccia crust that is nice and crispy on the bottom and soft in the middle all topped off with plenty of cheese, a tasty tomato sauce, and pepperoni! 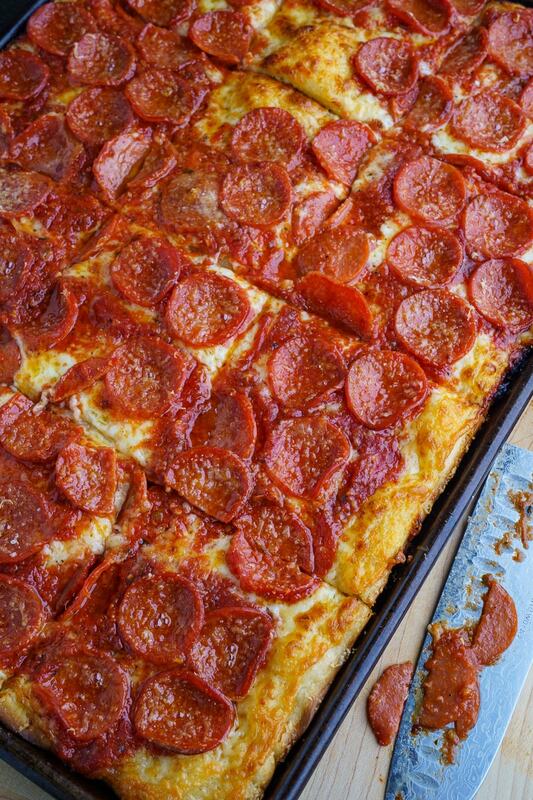 I am a huge fan of pizza and although I often go with a regular style pizza with the classic pizza dough I also enjoy the Sicilian style pizza! 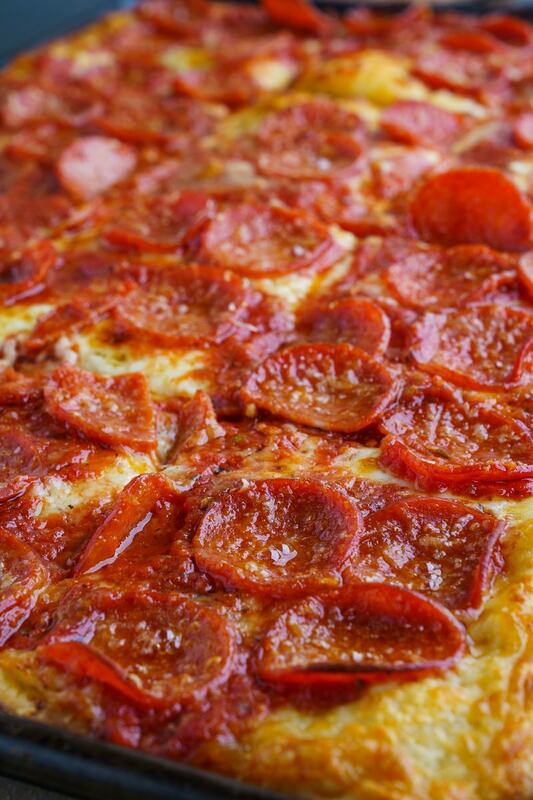 Sicilian pizza is a pizza that originated in Sicily, Italy, where it has a thicker, focaccia, style crust with topping and in North American it is typically rectangular in shape. 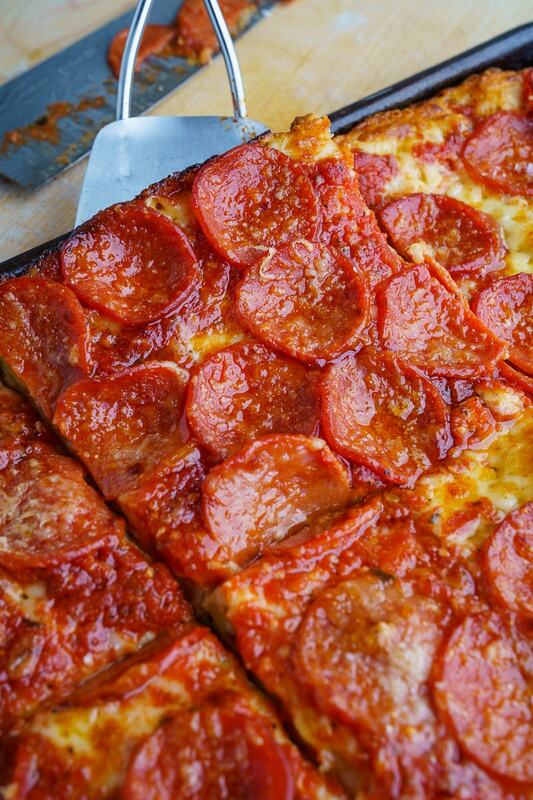 This pizza in baked in a rectangular pan and the pan is covered with plenty of olive oil so that the bottom of the crust soaks up that oil, and bakes until it is nice and lightly golden brown and crispy while the center stays nice and moist and chewy! Deli sliced mozzarella is often used rather than the more typical shredded cheese and it’s placed directly on the dough and this helps to prevent the pizza sauce from being in direct contact with the dough which might result in a soggy crust. I like to go with a simple and tasty pizza sauce and pepperoni along with a sprinkling of parmesan (or pecorino) for toppings but any of your favourite pizza toppings will work. 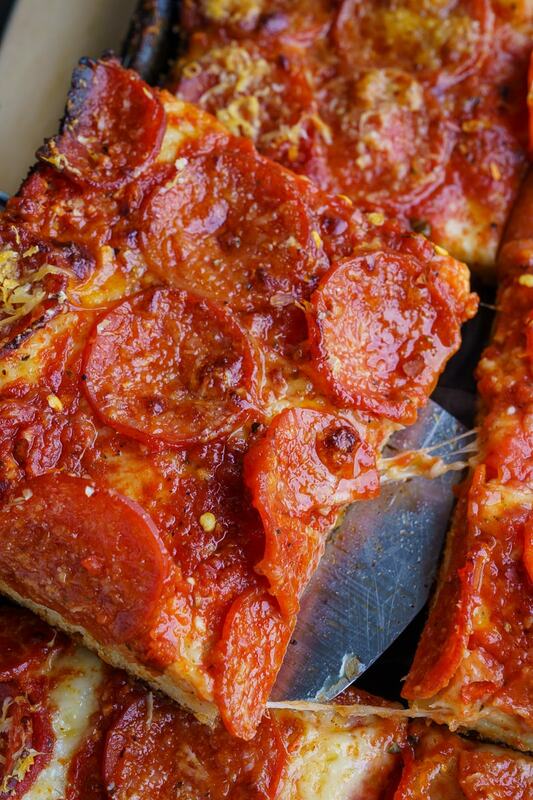 Just look at that yummy thick and chewy crust! Yum! 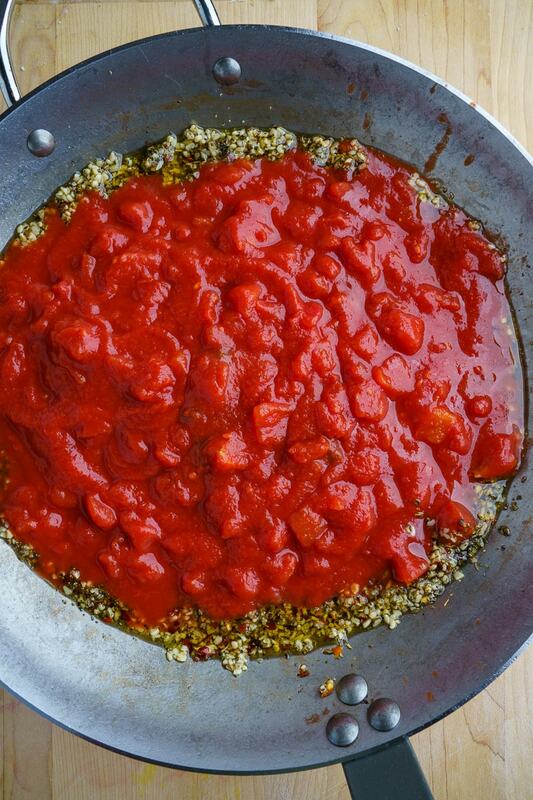 A quick, easy and tasty pizza sauce with garlic, oregano and red pepper flakes! Mix the water, sugar, olive oil, and yeast in a bowl and let it sit until the yeast foams up, about 5-10 minutes. Spread the olive oil over the bottom of a large jelly pan (about 12 inches by 18 inches), place the dough in the pan and gently spread it out with your fingers to cover most of the pan before wrapping the top in plastic wrap and letting it sit while you make the sauce. Heat the oil in a pan over medium heat, add the garlic, oregano, and red pepper flakes and cook until fragrant, about a minute, before adding the tomatoes, bringing to a simmer and adding sugar and salt to taste. Puree the sauce in a food processor. Unwrap the dough in the pan, gently spread the dough to cover the pan (if required), place the slices of mozzarella over the top of the dough, followed by the sauce, pepperoni and parmesan. Bake on the bottom rack of a preheated 450F/230C oven until the top is bubbly and the bottom is nice and golden brown and crispy, about 10-15 minutes. Option: You can use all-purpose flour instead of bread flour. Note: The dough will rise better in slightly warmer than room temperature so a well air conditioned room is not the best. If your place is cool, you can warm your oven at 200F for 5 minutes and let it sit in the now slightly warm oven (after turning it off). Option: Top the pizza with your favourite pizza toppings!